City of Anatolia, 54 miles from Constantinople and 21 miles from the port of Moudania. According to some chroniclers, the Jews of Brusa were the first to enter into relations with the Ottoman Turks and to come under their dominion. According to others, Sultan Urkhan, on capturing Brusa (1326), drove out all the inhabitants, and, in order to repeople it, imported Jews from Damascus, Aleppo, and other places in the Byzantine empire. Hence Brusa was the first Jewish community of Turkey. Sultan Urkhan, in consideration of a poll-tax called "kharaj," granted to the Jews a firman authorizing them to live in a special quarter (Yahudi-Mahalesi), to build a synagogue there (that of 'Eẓ Ḥayyim), and to have a chief rabbi. The Jewish magistrates ("memunnim"), popularly called "kharajros," receivers of the kharaj or tax, collected this tax and delivered it to the governor, under oath upon the roll of the Law. According to the historian Ubicini, persecutions obliged Spanish Jews to leave their country in 1415. "When they arrived at Brusa, the beauty of this Oriental city, the freshness of its waters, the multitude of its palaces and gardens that reminded them of Granada and Andalusia, induced them to settle here." Upon the great expulsion of 1492 other Spanish Jews settled in Brusa, and founded two new synagogues named, respectively, "Ḳahal Ḳadosh Mayor" and "Ḳahal Ḳadosh Gerushah." Toward the end of the sixteenth century and at the beginning of the seventeenth there existed inBrusa an important yeshibah, from which proceeded the well-known family of rabbis Algazi or Al-Gâzi. At this time Solomon Algazi I., "the Elder," author of thirteen rabbinical works; his brother Moses Algazi, also an author; and Joseph Gansou (1628), teacher of the Algazis, flourished here. As one of the remarkable events of the period 1600-1800 a conflagration is reported toward the end of the eighteenth century that destroyed half the city as well as the Jewish quarter. The rabbis of Brusa during the nineteenth century have been, in chronological order: Abraham Shilṭon; his son Elijah Shilṭon; David Carasso from Salonica; Abraham Ḥabib from Bosnia; Rab Shabbethai Halévy, brother of the grand rabbi Moses Halévy of Constantinople; a rabbi from Ismid; and R. Uzziel from Constantinople. The older Jews of Brusa tell the following legend: At the end of the eighteenth century a learned rabbi came incognito to that city from Salonica. He fell ill and died almost immediately upon his arrival, and was buried like any ordinary man. But a strange light was seen to hover over his grave for several nights in succession, which greatly excited the community. Upon inquiry it was learned that the stranger was a very pious and learned rabbi, Rab Segalia by name; and the people then decided to render him the last honors due to his position, by erecting a fine tomb-stone over his grave. The stone, accordingly, was placed on the mound. The next morning, however, it was found thrown down some distance away. It was restored, but again mysteriously removed overnight, and now the people no longer dared to replace it. At this tomb of Rab Segalia the people were wont to pray for rain in times of drought. Every trace of the tomb has now disappeared, owing to the construction of a road to the railway station. 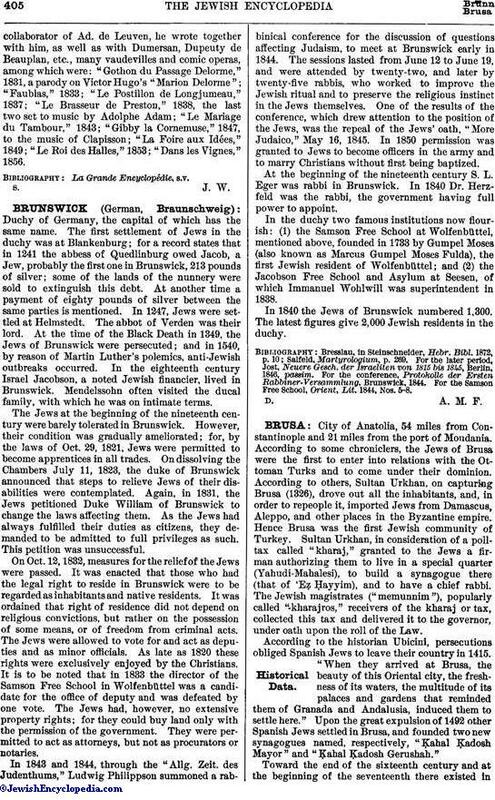 In 1901 the Jewish population of Brusa numbered 3,500 in a total of 100,000 inhabitants. The community possesses three very handsome synagogues, belonging to the congregations 'Eẓ, Ḥayyim. Mayor, and Gerushah. Of Jewish antiquities, there is in the synagogue 'Eẓ Ḥayyim a scroll of the Law more than 160 years old; and in that of the Gerushah congregation a unique old "rimmon" (a silver pomegranate forming part of the ornaments of the Torah scroll; the mate of this rimmon was stolen), dating back to the first half of the eighteenth century; and the Shilṭon family possesses some old manuscripts written by rabbis of that name. The notable families of Brusa are: Baraza, Caraco, Shilṭon, Franco, Saban, and Sévilla. The Brusa community has the following philanthropic societies: Haknasat Oraḥim, 'Ozer Dallim, Biḳḳur Ḥolim, 'Ose Ḥesed. The Jews of Brusa are very benevolent, and visit the poor in their own homes. There is not a single beggar in the city. In 1901 there were four hundred Jewish pupils—namely, one hundred and twenty-eight boys and seventy-two girls—in the two schools supported by the Alliance Israélite Universelle, and two hundred in the Talmud Torah. The chief rabbi of Brusa in 1901 was David Pappo of Constantinople. This official presides at the communal council elected by the notables of the city. The revenues of this council consist of taxes upon meat and wine and the rent of some real estate (a bath, an oven, and some shops). As formerly, the Jews still pay to the government a tax for exemption from military duty, called "bédèle." When the notables are short of funds and unable to pay this tax, the communal council draws upon the treasury of the three synagogues. These are governed by syndics ("gabba'im"). As a matter of fact the majority of the Jews are generally poor. Among them are two or three merchants, about fifteen money-changers, and a large number of small shopkeepers, pedlers, and dealers in tin ware. Although the silk industry is a specialty there, no Jews are engaged in it, beyond some two hundred Jewish women working as operatives in the mills. The Alliance Israélite maintains at Brusa a system for apprenticing boys as carpenters, black-smiths, tinsmiths, compositors, and for teaching girls to weave. 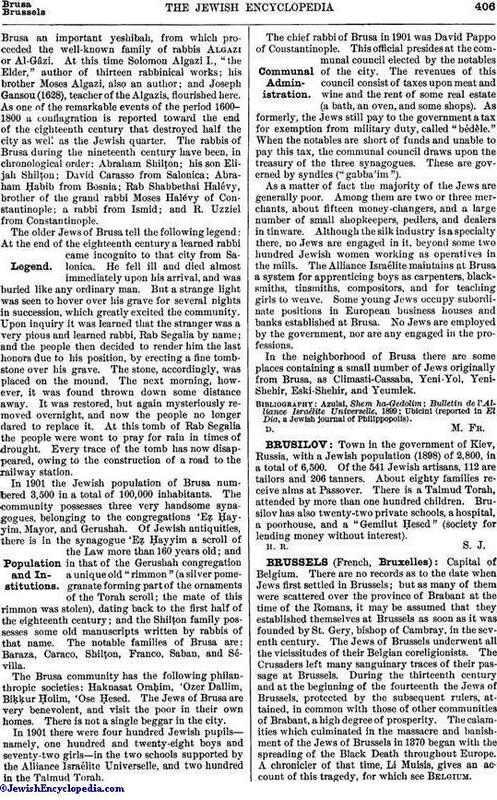 Some young Jews occupy subordinate positions in European business houses and banks established at Brusa. No Jews are employed by the government, nor are any engaged in the professions. In the neighborhood of Brusa there are some places containing a small number of Jews originally from Brusa, as Climasti-Cassaba, Yeni-Yol, Yeni-Shehir, Eski-Shehir, and Yeumlek. Ubicini (reported in El Dia, Jewish journal of Philippopolis).